Selection ViewerUse the selection viewer to see your selection! Estimated UK delivery by Monday, 29th April from just £1.27. Preciosa Czech glass seed bead, size 5/0 Green Iris iridescent metallic coated, approximately 4.5mm Czech glass rocaille bead. 15 gram packs contain approximately 150 Pieces. 100 gram packs contain approximately 1000 pieces. A really fresh and zesty kaleidoscope collection of green themed colours with intermittent blue, purple and bronze elements. Previous customers also bought these products. 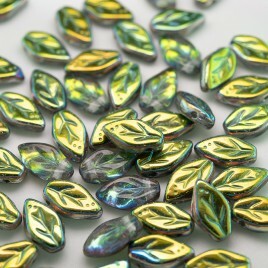 Vitrail wavy leaf 10x6mm glass bead. You need to add some items to your cart to use the selection viewer.